delightful indeed! well said drc; i love those urn shapes. Oh dear Karen.......I know how you feel, that is why we sunk the barrel in so I could have some water back in the garden........charming photo Mossy. You are so gifted, Mossy! 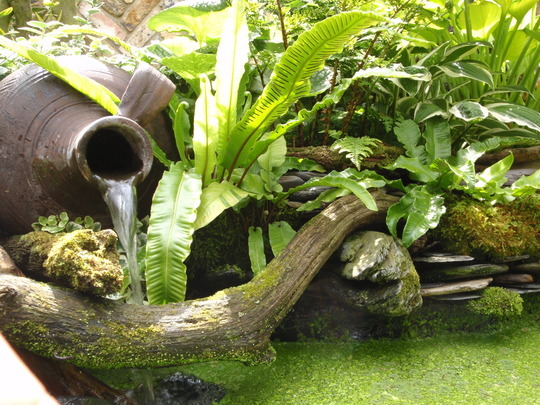 Beautiful pond with a lovely pot to add interest and sound to a great garden. have you got a photo of your barrel pond DD? i wondered about doing that ~ does it work well? That's lovely. You certainly have a talent for creating beautiful spots in the garden, Mossy. how much sun does a little pond need?? is it possible to have one in shade under trees?? i love this idea and wouldnt mind something like it in my garden. Stickiffee, you can have the pond in part shade (which mine is) to full sun. I personally prefer with my type of planting to go for half shade to shade. Yes, it is possible to have a little pond under trees, the only thing is that as the leaves fall in Autumn, you need to remove them as soon as possible. Go for it, as the sound of water is so important in a garden (so energetic). Everytime I feel weary or tired, I go and sit next to my pond and listen to the sound of running water, it is so relaxing. Oh what a lovely image, thank you Mossy. That is exactly what I would like. There is an area that needs a little something in my garden and nothing so far has worked! !